I haven't been able to play much latelly, a crazy amount of work has put a real dent in my free time.. Anyways, I have a tournement coming up in a few Weeks! My first real one since starting Warmahordes. There's been a few smaller tournements at my gaming club here in Oslo, but it's been a much more casual enviroment. My placings haven't been all that great, but with my newfound greater understanding of the game and the Faction, i believe i could at least get a decent result. But to do that i need to get as much practice in as possible! Makitties (trademark) will probably be my main drop, she just plays so good into a very wide variation of match ups, and is a real hard counter to pretty much every single problematic control caster out there (Wormwood, Coven, Haley2 etc.) So given my limited time to practice, i will probably dedicate most of my time to her. Starting with another control/assasination specialist. The dreaded Pop and drop! How will our first lady fare against the fanatic? Read on! My main goal was to go for Atrition, with the possibility of Scenario if the opening presented itself. With this list Atrition is often the way to go i believe. 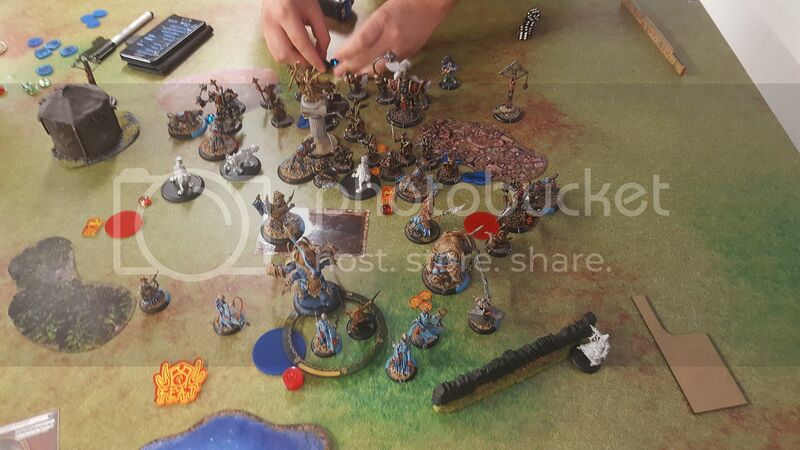 The list grinds exeptionally well, And if i play fast enough i can put a real time pressure on my opponent as well, all the angles the Ferox creates, and the time it takes to try and remove them takes a lot of time from the opponent. The scnario was Extraction and i got to go first! I Deployed in my usaual central position with Ferox on either flank. The extreme speed of the cats means that i can easily shift from one flank to the other if the need arises. Protectorate deploys centraly as well, The AD elements directly in front of the rest. Game on! The central positioning of my opponent means that there's harder for me to force my way on Scenario. If he had skewed to either side, i could move to the opposite one with makeda and block him out with a wall of Ferox. I know that Errants can be a real pain to remove (Self Sacrifice can be a real pain, and Defenders ward doesn't make the job any easier.) Three of his Jacks is standing behind them as well, so if i can make a frontline and jam them up early, i could create a real traffic jam, making it much harder for him to get them into play. Plan made i Rush both Beasts and run everything up pretty much as far as possible. Note how i use the measurement tools to mark his charge threats in the picture below. 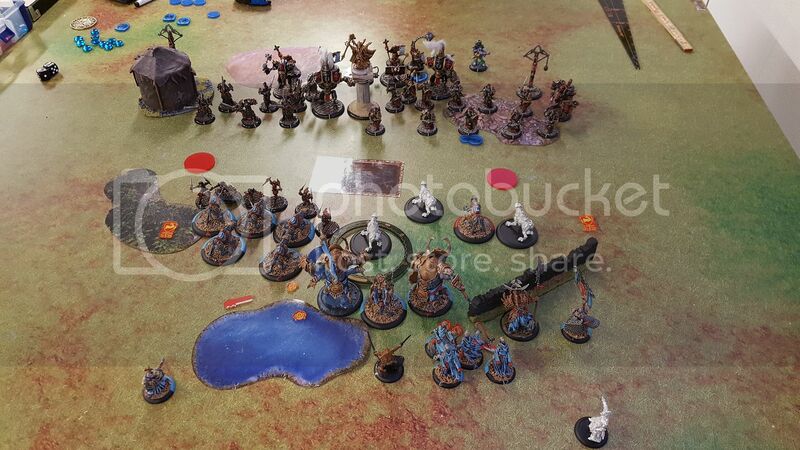 Premeasuring is an incredibly useful tool to have, and you should really use it to your advantage, Marking planned moves with proxy bases and checking if all your plans are possible before moving! It removes most of the problem of realising halfway through a turn that the things that you had planned is impossible. Kreoss is standing pretty much in the open behind the objective (The big statue of Sevvy) And within 16,5' of Radheim, camping 0 Focus. I could go for the assasination here, but there's really no point. True, he did kill a Ferox, but i should have little to no problems with dealing with his Jammers and keep up the plan of hemming him in on his Left flank. Radheim and Gladiator kills a couple of Jammers, The Right Ferox finish the job. Left Ferox runs forward to kill all Knights exemplar, denting the Crusader a bit and Jam. The rest moves up a bit, the Standard Bearer helps with contesting the right flag. Kreoss decides to Feat, then remembers that i pretty much ignore it. The rest of his Army then proceed to do absolutely nothing to me. He even Jams himself up even further by cramming the Errants around a couple of Ferox that he fails to kill, and misses with a few attacks letting me dodge back. He manage to catch a few things on fire though, and one Ferox was outside of Stay Death and bit the dust after attacks from the Crusader. Due to him failing so completely in killing Ferox, Makeda still sits at full Fury, so the Gladiator have to take a Threshold check, and Fails! Knocking 9 boxes off Radheim. Luckilly the Continous fire on him wears off. The rest of the Ferox manages fine as well. Willbreakers remove the remaining fires when they hand out Tough. I decide to make my move. 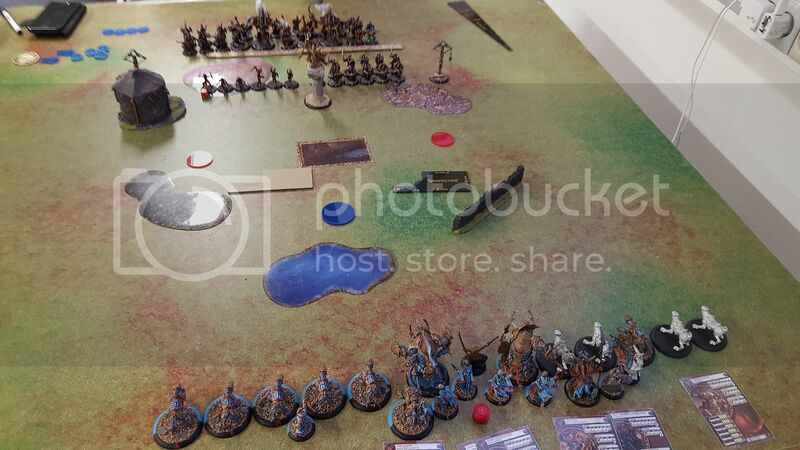 Ferox kills a few Errants, puts a few wounds into his Jacks and Jams. Radheim kills the Crusader, Tyrant cripples the right arm of the Revenger. I forget to move in to Score on the Left flag though. 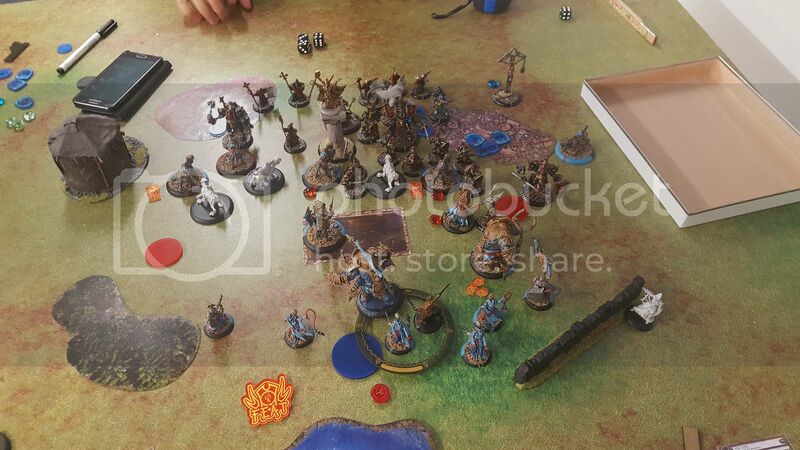 He tries to Unjam himself again, but his remaining infantry lacks the punch, and his Jacks are pretty much completely blocked from doing anything. He puts a few Cats on fire, but the damage is pretty much completely insignificant. My plan worked to perfection. With Daughters and Exemplar Knights out of the picture, that whole flank is mine to control, and his tight deployment meant that he blocked himself completely, making it next to impossible to launch a counter punch after my alpha. I really need to work on both playing faster, and the Fury management. Granted, he should have made me use some Fury on his devastatingly bad T2, but there was no need for me to risk having the Gladiator Frenzy. 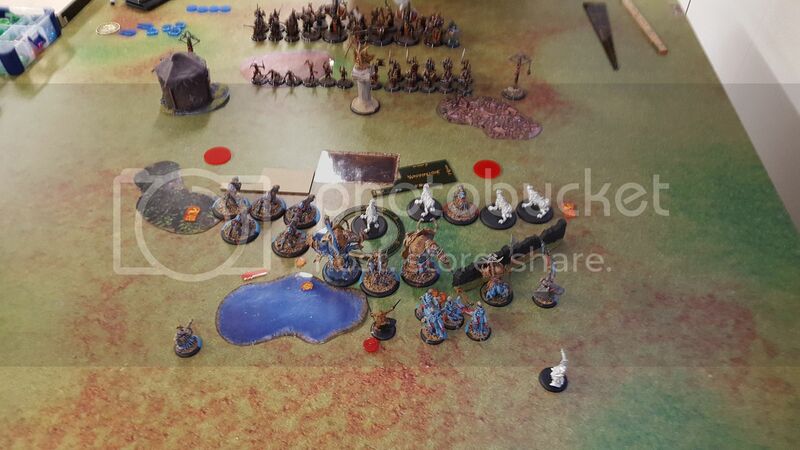 Losing Radheim that Early could have put a real stop to my plans as he is vital in scaring the enemy caster into positioning himself poorly in fear of assassination. This and the fact that he can clear half the boxes of a heavy, or nearly one shot a light with Storm Rager up makes him one of the strongest pieces in the entire list. He creates so much room for the other elements of the list by just being there, forcing the opponent to make tough choices and spend a lot of time trying to hide vital elements from him. 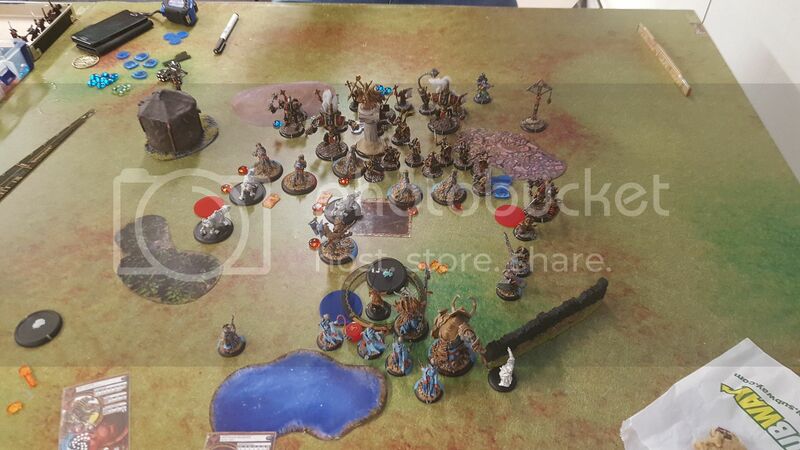 Glad to see the pictures come up along with a battle report. For clarification, I was the PoM player and I had a blast in this game. Despite my blunders and still being a bit in the dark in this new edition with my faithful menites it was great too play. My first blunder was my deployment. Errants make a great screen, and are really tough to remove with defenders ward and unyielding. In fact so hard to remove i I had nowhere to go with the stuff behind! I should have put the Errants, daughters and the infantry support on one flank and the jacks and warcaster on the other. The knights should have been centrally to plug any gaps. My second big mistake was throwing my daughters away in a jam. They don't have the stats to survive a jam. They should have been behind my errants, helping kill the ferox by ignoring tough, and two attacks each with auto wound. Daughters are great, but only as assassins. My third big mistake was not using Kreoss better. He should have been flinging spells to help with the grind, and not being to intimidated by the wall of jumping ferox. Being aggressive is the name of the game, and I was to timid and it cost me. This was a valuable experience in my eyes. The sheer intimidation factor of seeing two full units along with a dragoon, where the units are tough, steady, pathfinder, mobile and basically a better version of Harbys martyrdom ability backing them up is hard to comprehend. But, I am sure that despite Kreoss 1 being a bad drop against a list like this, I am certain that my list could manage given the knowledge I gained from this game. Brick up, focus fire, and make use of the anti-tough tech in the form of the daughters would help with the attrition. I think once the Skorne community stop whining and open their eyes, they will see that there is a lot of potential in units like Ferox. They offer a great package of abilities along with decent enough hitting power. I look forward to testing my faithful menites again against this heretical abomination of a list that must be laid to ashes before the creator of mankind. 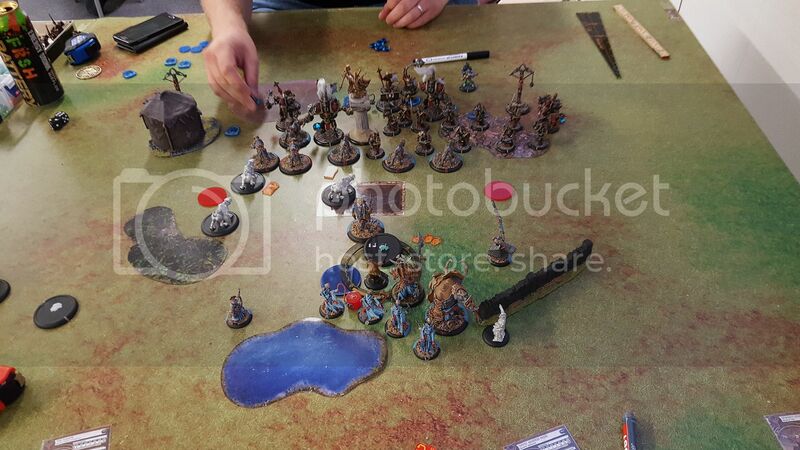 Glory to Menoth! I started using a version of this list, but with Marketh instead of one willbreaker and the maligned Rhinodon instead of a Titan. Basically, I wanted Marketh to minimize the fury demands on Makeda. I'm realizing Despoiler might be a useful substitute for Marketh and the Rhino.